I absolutely adore fall. It is my most favorite season, and I look forward to it all year long. The crisp mornings, yummy smells, brilliant leaves, cozy sweaters, warm fires, football games, pumpkin patches, cider mills, apple picking, bonfires, trick-or-treating, roasting pumpkin seeds, carving pumpkins…I could totally go on and on and on! There just really isn’t anything about it that I don’t love! Making a fall bucket list is a great way to really celebrate autumn, and helps you enjoy all the wonderful things there are to do and see! Fall means the start of the holidays, more time spent with family and friends, and the best four months of the year! Our family has so much fun doing these things together, and also inviting friends to join us. They create memories, start traditions, and can strengthen relationships with each other. Our kids look forward to these activities every year, and we are always relegated with “do you remember when…?” as they recall past years’ events, outings, and memories. I love that so much! The best things in life are so often the simple things too, and that’s the case for these activities. Jumping in leaf piles, carving pumpkins, baking pies or cookies, going on a walk–these are all fun & easy things you can do with your family to celebrate fall together! 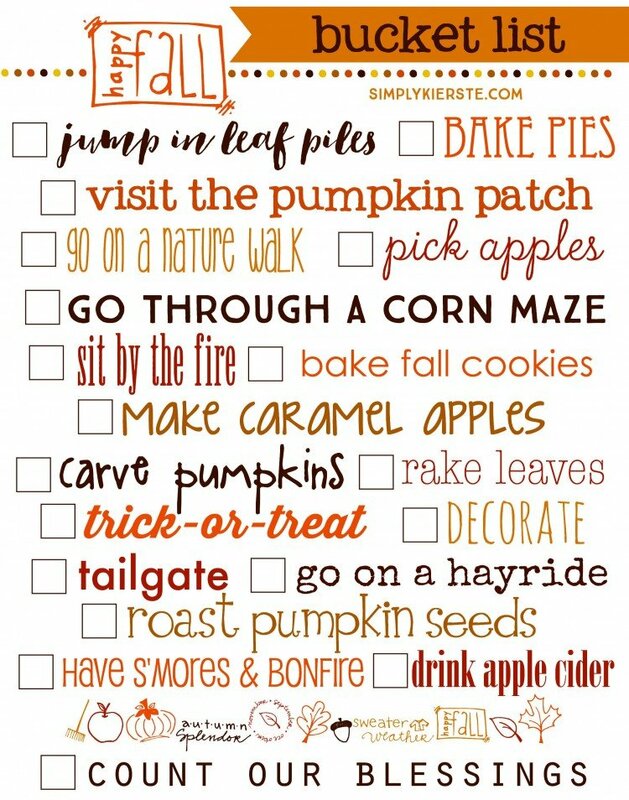 Not only is this a great bucket list, but it also makes darling fall decor! Print, then place in a frame, or laminate–then you can check the boxes as you go! You can download the printable version below. You can either print on white card stock (the 8×10 size), or get them developed as prints (8×10 or 11×14). I have a bunch of other fall projects and ideas you might like too! Love this! My favorite time of the year and so many fun activities to do! Thank you for the printable. I just printed it and placed it in a frame on my kitchen counter. Do you think it is possible I could mention your printable in a blog post? Thank you for sharing. Hello Kierste! Thank you so much for the printable and for sharing! This is going in the Family Fun/Date night folder for sure! Could I also mention your printable in a blog post? I’d make sure to link back to your post and let everyone know this great creation came from you! I think the family would love to see the checklist and try some of the ideas for themselves! Thanks again for sharing! Thank you! This will be the first time that I experience living in a state where I will see the four seasons! I look forward to doing all of the suggestions on your bucket list! YAY!! So excited for you–you’re going to love it!! !